Halloween is right around the corner, and with all the cool/fun things going on, kids may forget about the cool/fun things they learn about in school. 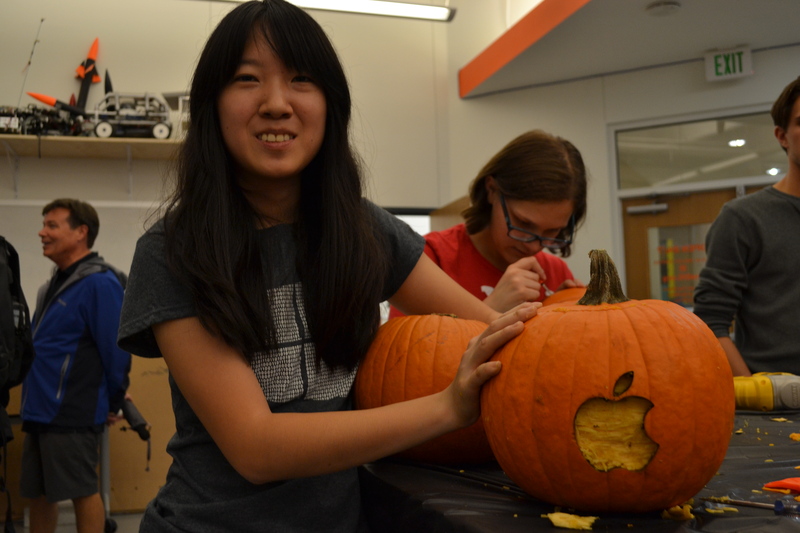 The best way to reiterate what’s going on in school is to combine STEM and Halloween! Do these awesome STEM Halloween activities to get your kids excited about Halloween AND school! Glow in the dark jack o’ lanterns are super cool! For this experiment, you will need to purchase Glow Powder to add to your pumpkins, but the students will learn all about illumination. 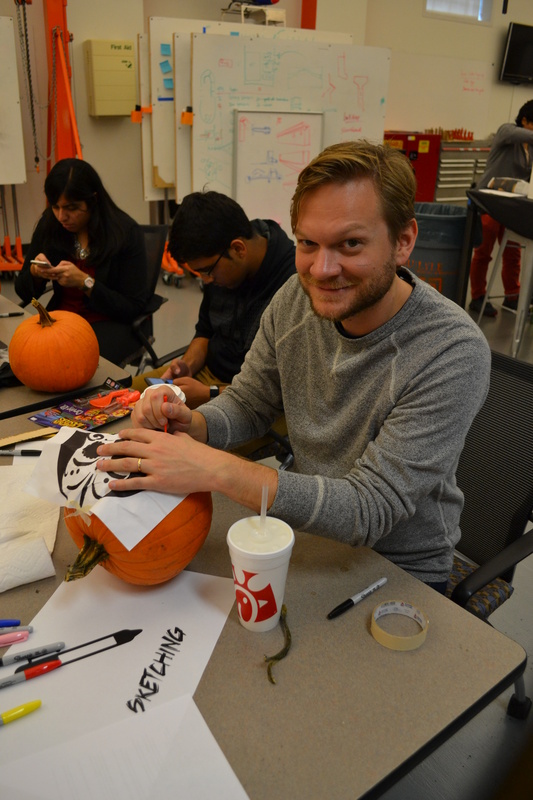 What you need to do for this experiment is simple – make your pumpkin and add adhesive and glow powder! Afterwards, your students will be able to connect fluorescence and phosphorescence to the activity they just completed! 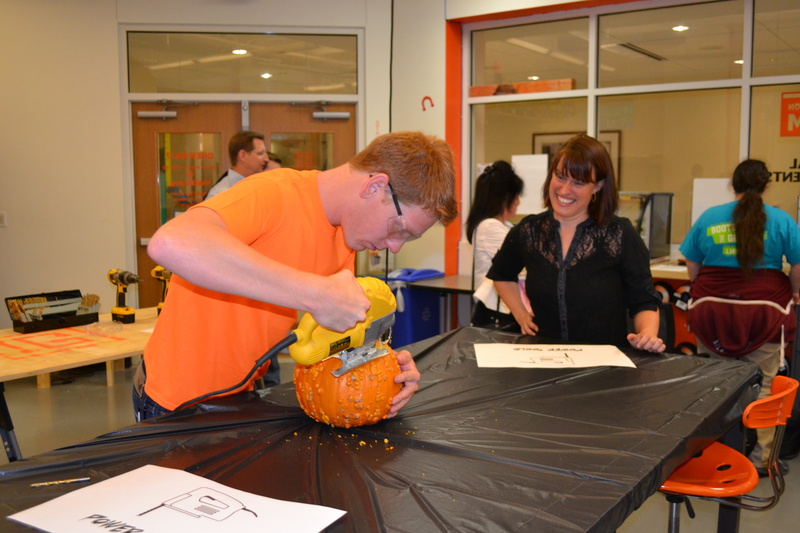 Make oozing pumpkins with your students to teach them about chemical reactions! These pumpkins are jack o’ lanterns that have foam oozing out of their mouths, eyes, and noses through the use of easy household ingredients. The reaction of hydrogen peroxide and a yeast mixture causes the foam to form. The yeast acts as a catalyst which speeds up the reaction. Students will learn all about reactions and catalysts through this cool experiment! Make a Screaming Cup with your students. Students will learn about sound transmission through vibrations. 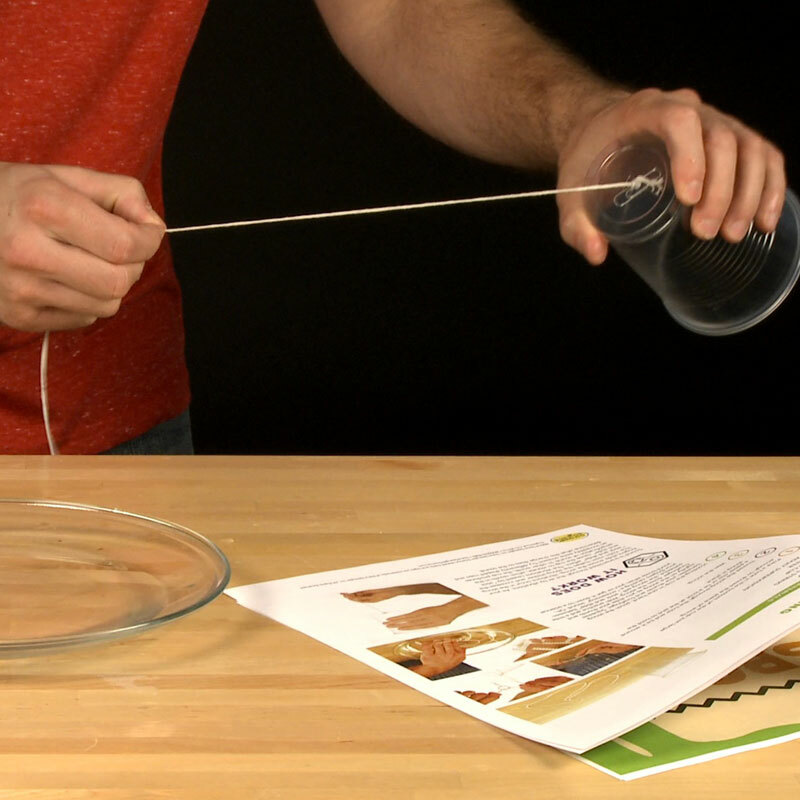 The materials used for this experiment are simple: a plastic cup, a piece of string, and violin rosin! The procedure is also simple – cut a hole in the cup, thread the string in and tie it, and wet the string with violin rosin. When you rub your fingers along the string, there will be a screaming noise! Students will learn that the vibration from your fingers causes the amplification of the sound inside the cup which causes the screaming sound! Not only will they learn about sound and vibrations, they will also be able to relate it to Halloween! We hope you and your family have a great and safe Halloween! Don’t forget to do these cool STEM activities and learn something new along with the festivities! It’s always busy in the Caruth Institute for Engineering Education, but it’s also always exciting! We have some awesome events happening soon; below you’ll find descriptions of whats coming up! TEDxSMUWomen 2016 is on October 27, 2016 at the Hughes-Trigg Student Center at SMU in Dallas, TX. TEDxSMUWomen is a full day conference that consists of networking, discussions, workshops, and live, local speakers! TedxKids@SMU: Illuminate is on November 11, 2016 at The Bomb Factory in Deep Ellum. TEDxKids@SMU is a TED-style conference for middle school students that focuses on passion and ideas. 7-9 speakers will share their ideas, and in between sessions, students will be able to interact with speakers and each other! Students who attend are required to complete a service project. TEDxSMU After Dark is also on November 11, but this event is at 6 p.m.! TEDxSMU After Dark is a casual, fun night with food and drinks, speakers, and live music! TEDxSMU 2016: Illuminate is on November 12 at The Bomb Factory! There are two sessions of TEDxTalks from local and national speakers! In between sessions, attendees get to talk to speakers and each other, and they also get to participate in interactive exhibits and discussions. February 18, 2017 is Visioneering 2017! Visioneering is a half-day event for middle school students! Students from all over North Texas come to SMU and participate in an engineering design challenge to learn all about problem solving and engineering! Another event a little later in February is the Dallas Regional Science and Engineering Fair. This event will take place on February 25, 2017, and it will consist of just what it sounds like – a science and engineering fair! Students will bring their projects to showcase them in hopes of advancing to the next round! All of these events are so cool and a ton of fun! We have a busy (and super exciting) year ahead, and we hope to see you at our events! Over the summer, we had a lot of cool programs for middle school and high school students, but we also had cool programs for teachers! We had two professional development courses for teachers of grades 4-8 and for high school teachers! The first course was Classroom Robotics for Teachers Grades 4th-8th. The course was one week long and consisted of an introduction to the LEGO Mindstorms EV3 System. Participants learned about EV3 programming and building and were given activities to use in the classroom! The next Teacher Professional Development Course we had was the UIL Robotics Training FIRST Tech Challenge (FTC) and First Robotics Competition (FRC) course. The training consisted of learning about coaching a team in the FTC or the FRC! Participants learned how to organize teams, understand project management, and effective strategies to build/program a robot. Because this is the first year that Robotics is considered a varsity sport in Texas, these professionals were some of the first that will be participating in the new events! These trainings were very cool, and the teachers learned a lot and had a great time! Summer is one of the most exciting times of the year – school’s out, the sun’s shining, and kids (and adults) get to do cool things they wouldn’t normally be able to do during school! This summer at the Caruth Institute for Engineering Education, we hosted a variety of programs for students in middle school and high school. The first one we hosted for middle school students was the Mindstorms Robotics Program. Students spent two weeks learning all about robotics using the LEGO Mindstorms EV3 System. They worked together and learned how to build and and program a LEGO robot. Another program for middle school students was Introduction to Programming. Middle school students spent two weeks learning how to program simple devices. They learned simple to complex function programming. They got to make electronic devices and program them! It was a really cool experience for the students participating and for the adults that were there to help! Another cool program was the Crime Scene Investigation Summer Program for 6th and 7th grade students. The students spent three days exploring science, technology, engineering, and math to learn how each subject is relevant when trying to solve crimes! Students even solved a “real” crime scene and got to see presentations by professionals in the crime scene field! The Rocketry Program was also a ton of fun! Middle Schoolers spent two weeks designing, building, and flying a model rocket from scratch! They built multiple rockets prior to the final model rocket, and throughout the two weeks the students learned a ton about what goes into rocket flight! Quad-Copters are fun – especially when you have a summer program devoted to learning all about them! Quad-Copters have recently gained a lot of popularity as they are going to be used in a variety of places. Middle school students spent two weeks learning how quad-copters work and got to use quad-copters to go through an obstacle course! The last program we did for middle school students was The Competitive Robotics FIRST LEGO League Program. This program lasted one week and prepared the students for the FIRST LEGO League Competition in the fall. Students got to learn a lot and build a robot! Along with programs for middle school students, we also hosted programs for high school students! They were just as cool and just as exciting as the programs we held for middle schoolers! We hosted a residential engineering program for 11th and 12th grade students. This program was split into two sessions – one for boys and one for girls. Rising juniors and seniors were able to explore the different fields of engineering offered at the Lyle School of Engineering. The first two (of five) days were spent building skills in the fields of electrical engineering, mechanical engineering, and computer programming. Then, the students were assigned a design challenge to build a prototype to solve a real-world problem! The program ended with a project presentation. This program was a lot of fun for everyone! The next camp we held for high school students was the Advanced Robotics (FIRST Tech Challenge) Program. During the week long program, high school students worked together to build a TETRIX robot. Not only did they build awesome robots, they also learned to program their robots autonomously and with remote controls! We also hosted a Quad-Copter Program for High School Students. Students spent two weeks learning all about quad-copters, and eventually went on to design and build parts to add to their own using CAD software and 3D printers! Students learned the rules quad-copters have to follow, and were able to fly the copters through an obstacle course. The students even got to compete with one another to see who was better able to get through the obstacle course! Students and teachers enjoyed the program, alike! The last (and one of the coolest) programs we hosted for high school students was the Space Launch Program! This program was two weeks long, and students learned all about space flight through the use of a launch simulator, rockets, and a weather balloon. The students designed, built, and flew a model rocket, sent a weather balloon up in the air and monitored the temperature and pressure of the atmosphere, and learned how to use a 3D printer, CAD software, and program sensors! There was always a cool program going on at the Caruth Institute this past summer! Although, as with every project, there were some head-scratching moments, students and teachers all had a great time. We’re sad that this summer has concluded, but we can’t wait until next year to have an even better time! April is Math Awareness Month, and the theme is The Future of Prediction! This year’s theme is meant to show how math and statistics are used to predict the future! For resources to use during Math Awareness Month to explore the theme from the National Education Association for students in grades K-12, click here! Apart from using these resources, take time to teach your students (or learn yourself) about how math is all around us. Without math, we wouldn’t have any of the cool technology we have today – we wouldn’t even have the chairs we sit on or the buildings we live/learn/play in! Math is all everywhere, but we just don’t realize it! So, take some time to appreciate math this month! Also, how fitting that Square Root Day (4/4/16) was in April (Math Awareness Month) this year! It’s crazy how cool math is! In a world where knowledge of STEM is vital in choosing a career, the variety of STEM related programs in schools was limited. However, this has been recognized as a problem that needed to be resolved, so UIL has added a robotics competition! This year has been the first year this is being implemented, and the competition has been divided into two divisions, BEST and FIRST. BEST is for smaller schools without official robotics programs, and FIRST is for schools with more advanced programs and teams. Both divisions have had a huge impact on various schools, and they have definitely increased students’ interest in STEM and robotics! We are looking forward to how this program will take shape over the course of the next few years! National Engineering Week – Visioneering! February 21-27 was National Engineering Week 2016! To kick off National Engineering Week, The Caruth Institute for Engineering Education in the Bobby Lyle School of Engineering at SMU hosted their 16th annual Visioneering event! On February 20th, over 90 middle school teams from all over DFW came to SMU to display their engineering skills! After teams arrived, they were welcomed in the auditorium through a welcoming ceremony where they learned about what engineers do, and they were presented with this year’s design challenge! This year’s challenge consisted of the students designing a classroom for the year, 2025. After they were given the challenge and some ideas, they were sent off to various classrooms across SMU to work on the project! When in the classrooms, students met with their mentors (either a professional engineer, an engineering student from SMU, or a professor from SMU). Mentors introduced themselves, described the field of engineering, and discussed the engineering design process. Students were given time to brainstorm ideas that they had for their classrooms of the future based on things they thought were wrong with the classrooms of today. After brainstorming, students worked with a partner to design a drawing of what they think the classroom should look like. After the partner activity, students worked together as a team to finalize ideas before they moved on to their diorama. After finalizing their ideas, students created a diorama of their classrooms with card-stock paper, construction paper, markers, and a shoe-box. Students got pretty creative with these dioramas. Some students wanted courtyards inside, doors that lead to playgrounds, multiple floors (1 for education, 1 for studying), holograms on the walls, whiteboards/smartboards that were connected to each student’s desk, and more! Students really got creative with their ideas for their classrooms! After the creation of the classrooms, students were expected to present their creations to judges. Each student was expected to have a role in the presentation to explain each new idea they had for their classrooms. After presentations/judging, students returned to the auditorium for snacks, an engineering panel, and awards! Six teams were awarded for various aspects of the project, but everyone left with the satisfaction of creating an engineering project! Students and mentors enjoyed, alike, and students left knowing how to work in a team, to not be afraid to share their ideas, and with more knowledge about what engineers do! Visioneering 2016 was a success, and we can’t wait for next year! What’s going on at Lyle? These past few weeks have been an exciting time at the Lyle School of Engineering. There has been a Community Challenge to design and build a Foosball table and a Custom T-Shirt Workshop at the Deason Innovation Gym, and really cool project presentations for a Form and Composition class within Master of Arts in Design and Innovation (MADI) Program! In the Deason Innovation Gym here at SMU, the members of the entire SMU community were offered an opportunity to participate in a community challenge! The goal of this challenge was to design and build a fully functioning Foosball table! After a prototype was built, the participants went on to build the final product! The first Community Challenge has been a success so far, and we can’t wait until the next one! However, that is not the only cool thing going on at the Deason Innovation Gym (DIG) – the DIG also held a Custom T-Shirt Workshop! At the Deason Innovation Gym, there is always something going on to stir creativity and innovation – this time it was a Custom T-Shirt Design Workshop! Students signed up and were invited to the DIG to create their own personalized custom t-shirts! The workshop started off with brainstorming and learning how to create the design on the computer! Then, participants went on to the creation of their design by learning to use the vinyl cutter! The students ended up with cool t-shirts to wear and new-found knowledge! Apart from the cool events going on at the DIG, there are some other cool things going on throughout the Lyle School of Engineering! As a part of the Master of Arts in Design and Innovation (MADI) program at SMU, students took a Form and Composition class. The class was a fast paced introduction to 2D graphic design and 3D design. As part of the final project, students were assigned the task to create a concept for a chair that met a specific human need. After coming up with the idea, students were tasked with creating a large scale 3D model and an advertisement for their chair. Students started their chair idea with a sketch, went on to a small model, created a larger model, then went on to create their prototypes (along with their advertisements) for a final presentation. The chair ideas were really cool! Every semester, SMU’s Lyle School of Engineering offers a First Year Design course for (mostly) first year students. The course consists of students being assigned to teams from all different disciplines. Teams are then assigned the task to build a robot to autonomously operate through a given course, and they are expected to have this completed by the end-of-semester competition, Battle of the Bots. At Battle of the Bots, teams get the chance to show their skills to the SMU community as their robots compete to win the competition. This year’s Battle took place outside, and the robots were expected to move out of the starting box, find a designated container, measure the conductivity of the contents of that container, climb a platform and take measurements, navigate through barriers, and much more! During the competition, some teams had to troubleshoot their robots, and some had to re-position them. By the end of it, students were exhausted. However, the students came together to make cool robots! 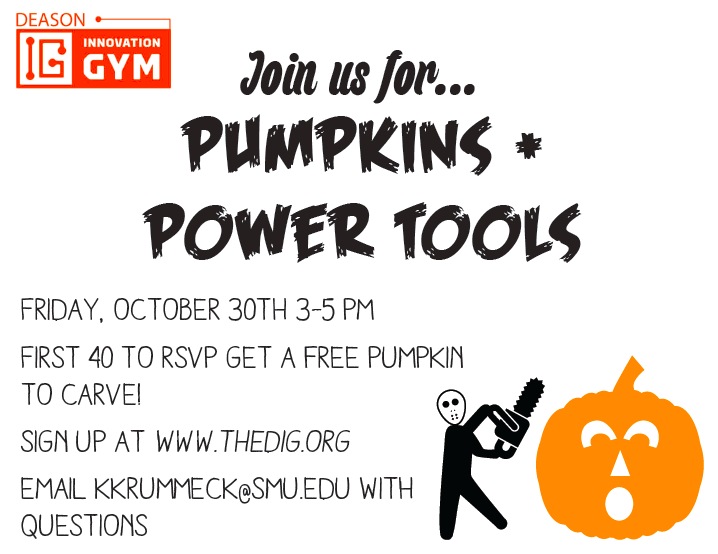 Today the Deason Innovation Gym at SMU’s Lyle School of Engineering hosted their annual Pumpkin’s + Power Tools Event! 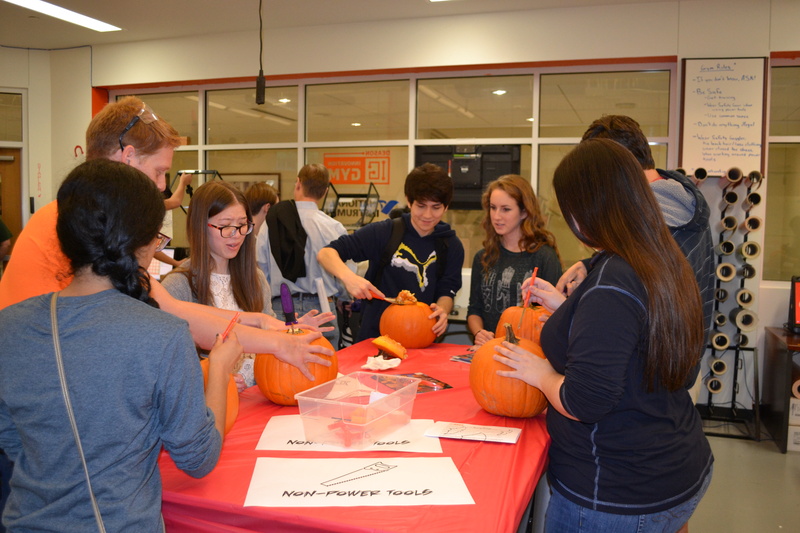 The event consisted of stations to properly carve each pumpkin to perfection. The first station was the sketching station – because every masterpiece starts with a creative idea and a brainstorming session! Next came gut removal! 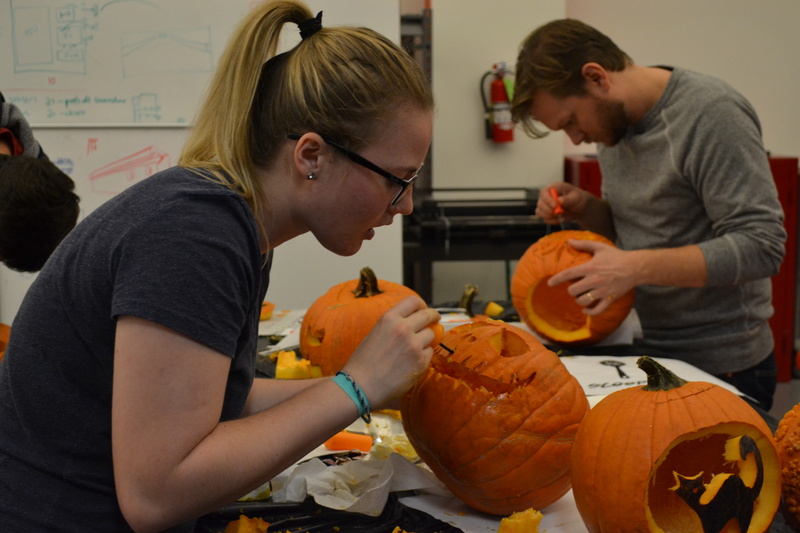 This station got really messy – our pumpkin carvers had to cut off the top of the pumpkin and remove the insides of the pumpkin before they were able to carve them! 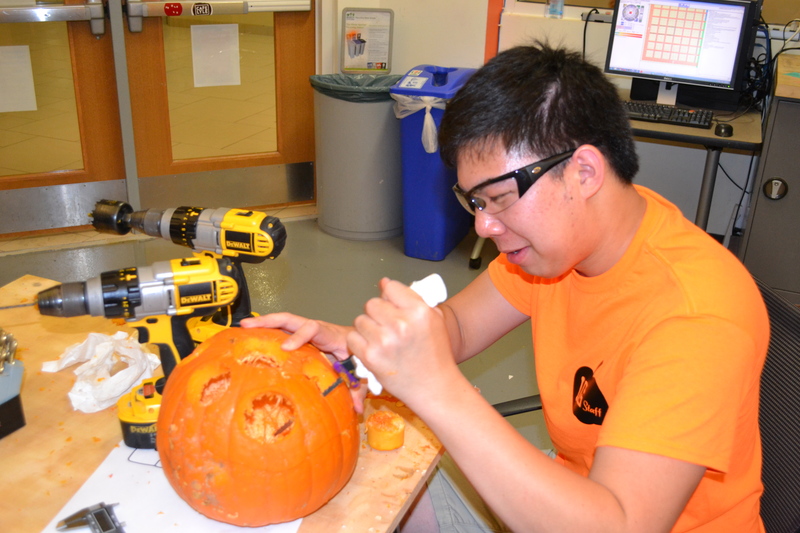 Some participants used power tools to cut off the top of the pumpkin, but some chose to go the traditional route! 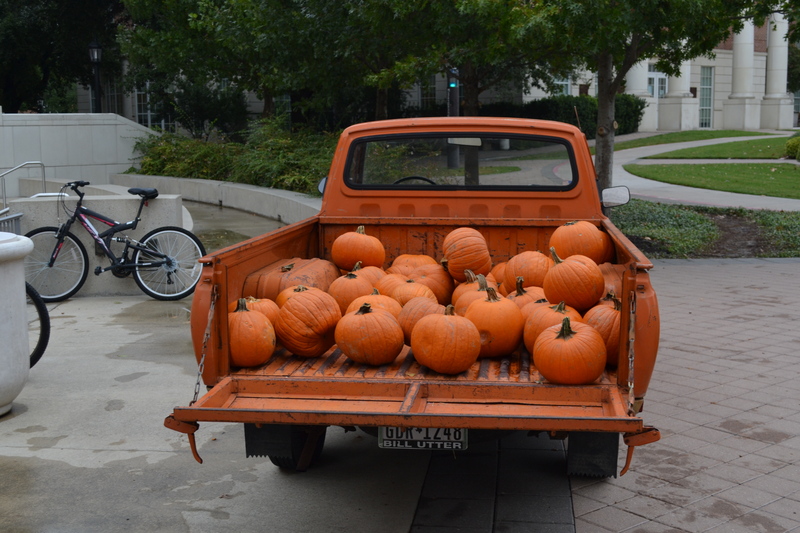 Next came the fun stuff – the actual carving of the pumpkins! 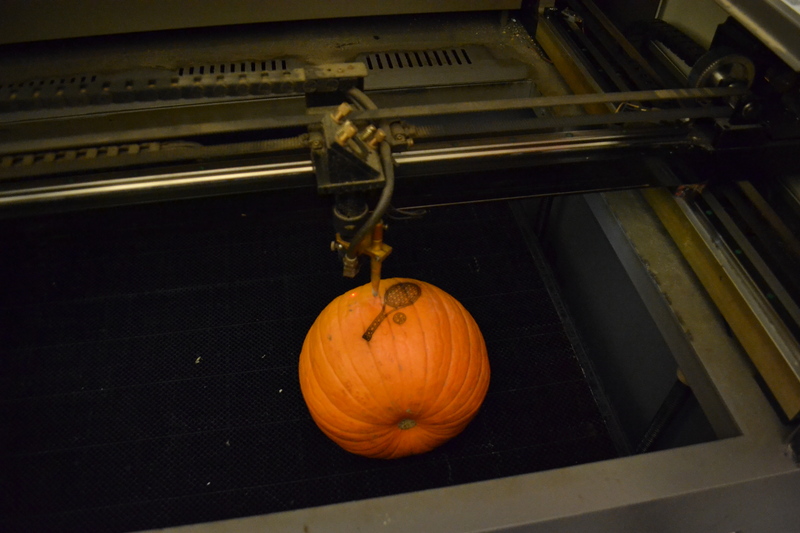 This is where the participants got the most creative – some chose to use power tools, some chose to carve by hand, and some chose to use the laser cutter! 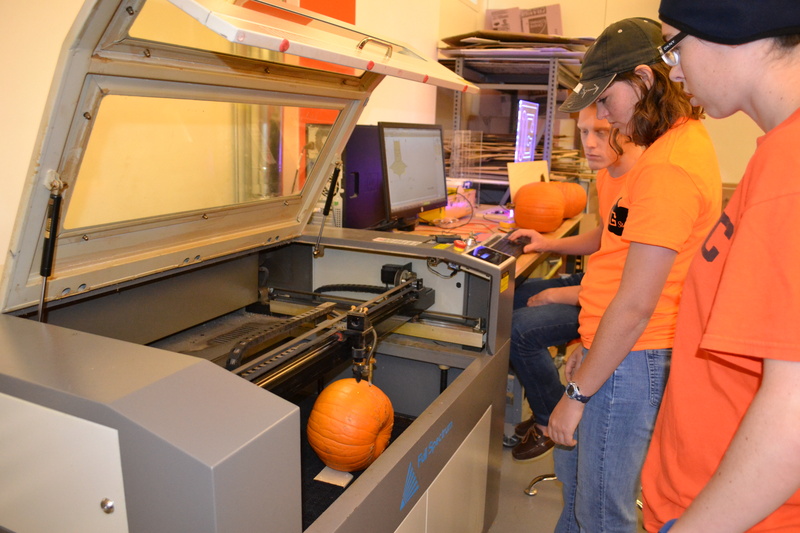 This event was one of our favorite events of the year as it incorporates the design process (organization and planning), science (the actual anatomy of the pumpkin while cleaning it out), and technology (power tools and the laser cutter)! 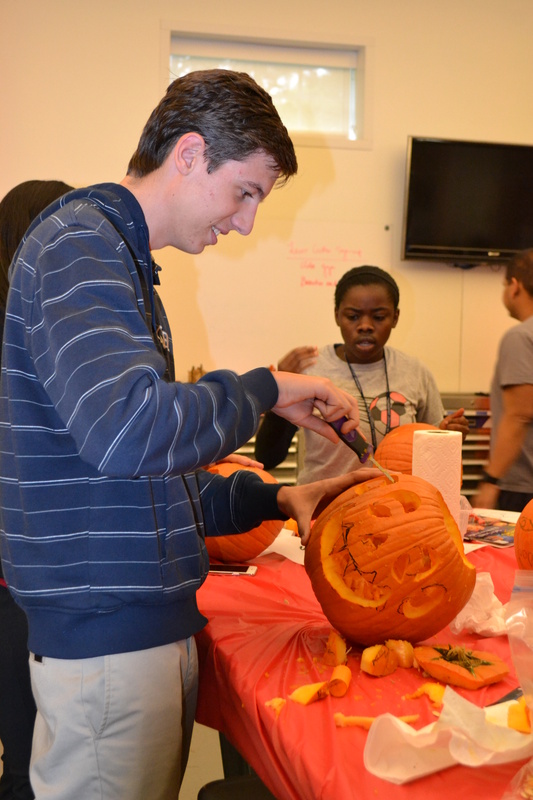 Everyone at this event, pumpkin carvers AND observers, had an outstanding time, and the best part was that everyone got to use their creative skills and learn something new! We hope everyone has a safe and STEM filled Halloween!